Reagan Hoggatt (left) and Sidnie Hunt were the recipients of Special Achievement awards at the Union City Chamber banquet and awards program this year. 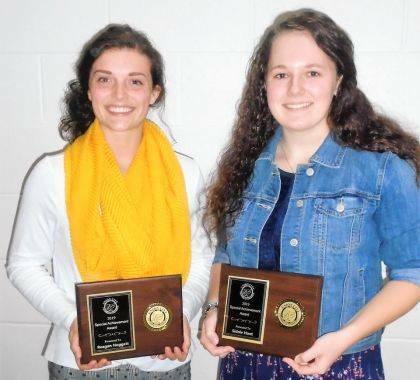 UNION CITY – Two female students were selected to receive the Special Achievement awards at the recent Union City Chamber banquet and awards ceremony at Mississinawa Valley School. Recipients were Sidnie Hunt and Reagan Hoggatt. The daughter of Wade and Billie Hunt, Sidnie Hunt has participated in volleyball and basketball four years at Mississinawa Valley Schools and also has participated in FFA for five years, including serving on the officer team for three years. She is a two-year member of the National Honor Society. After high school, Hunt plans to attend Rhodes State College where she will major in occupational therapy assisting. She also has been named one of three valedictorians. Hoggatt is active in cross country, in which she was a semi-state finalist, track and basketball, in which she was a member of the state runner-up team. She is a member of National Honor Society, student council and SADD. Hoggatt was a musical cast member, involved with KISS TV and DECA (district president) and is a Lilly finalist. The daughter of Brad and Amy Hoggatt, she will attend Depauw University where she plans to continue her cross country and track career. Reach Linda Moody at 937-548-330. To join the conversation and get updates on Facebook, search Advocate360 or The Early Bird. For more features online, go to earlybirdpaper.com or dailyadvocate.com. This entry was tagged Indiana, Union City, Union City Chamber. Bookmark the permalink.